NEW YORK (Jan 26): Wall Street sold off on Monday, pulled lower by further weakness in oil prices as energy shares led declines, with major indexes retreating after last week's strong gains. Oil prices fell 6 percent on concerns of oversupply after news that Iraq's output reached a record last month. The S&P energy group dropped 4.5 percent, the worst performing sector. Exxon and Chevron each fell more than 3 percent, while ConocoPhillips tumbled 9.2 percent after Barclays said the company should cut its dividend by at least 75 percent. The major indexes each fell more than 1 percent, reversing much of a two-session rally that marked Wall Street's first week of gains in the year. All 10 major S&P sectors finished the session lower. During the poor start for the year for U.S. stocks, their performance has closely correlated with the price of oil. The commodity's dramatic 1-1/2-year slide has sparked broad concerns about a global economic slowdown. "Today is all about oil," said Michael James, managing director of equity trading at Wedbush Securities in Los Angeles. "Better oil markets Thursday and Friday led to better equity markets. A $2 retracement in oil today, it's not surprising to see a retracement in the equity indices." 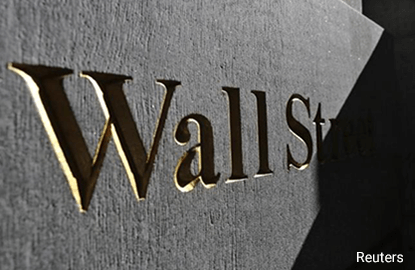 The Dow Jones industrial average fell 208.29 points, or 1.29 percent, to 15,885.22, the S&P 500 lost 29.82 points, or 1.56 percent, to 1,877.08 and the Nasdaq Composite dropped 72.69 points, or 1.58 percent, to 4,518.49. Investors will look for insight about the economy's direction later this week as many heavyweight companies report results. Federal Reserve policymakers meet on Tuesday and Wednesday for the first time since raising interest rates in December. "The macroeconomic reality is catching up to equity valuations, and you're seeing folks say, 'I'm going to take my winnings and get out of the way for a while,'" said Jeff Buetow, chief investment officer at Innealta Capital in Austin, Texas. D.R. Horton shares fell 4.7 percent to $26.40 as the No. 1 U.S. homebuilder reported lower-than-expected revenue as its home sales fell in all regions but the Southeast. Tyco International jumped 11.6 percent to $34.15 after Johnson Controls said it would merge with the Ireland-based fire protection and security systems maker. Johnson Controls dropped 3.9 percent to $34.21. Shares of Dynegy and NRG Energy slumped 11.5 percent and 9.6 percent, respectively, after the U.S. Supreme Court upheld a major Obama administration electricity markets regulation. Caterpillar dropped 5 percent to $57.91 after Goldman Sachs cut its rating on the stock to "sell". Twitter fell 4.6 percent to $17.02 after Chief Executive Jack Dorsey said four senior executives would leave the social media company. About 7.9 billion shares changed hands on U.S. exchanges, slightly below the 8.1 billion daily average for the past 20 trading days, according to Thomson Reuters data. Declining issues outnumbered advancing ones on the NYSE by 2,642 to 466, for a 5.67-to-1 ratio on the downside; on the Nasdaq, 2,132 issues fell and 716 advanced for a 2.98-to-1 ratio favoring decliners. The S&P 500 posted 3 new 52-week highs and 22 new lows; the Nasdaq recorded 12 new highs and 103 new lows.